Congratulations to Sri Vanarasi on the submission of his PhD thesis titled “Delivery across biological barriers using RAFT polymers”. 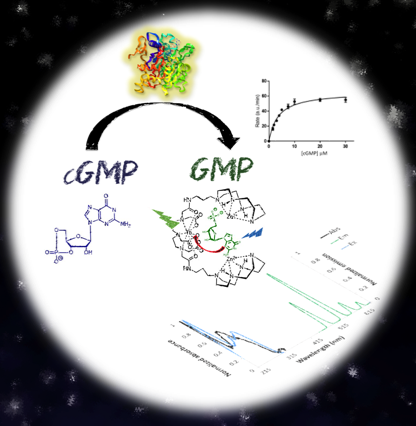 Our paper "Interaction of Nucleotides with a Trinuclear Terbium(III)-Dizinc(II) Complex: Efficient Sensitization of Terbium Luminescence by GMP and Application to Real-Time Monitoring of Phosphodiesterase Activity” has been accepted for publication in Inorganic Chemistry. Fantastic collaborative effort between the teams at Monash, Durham University and UNSW. Congratulations also to Maggie who is first author. 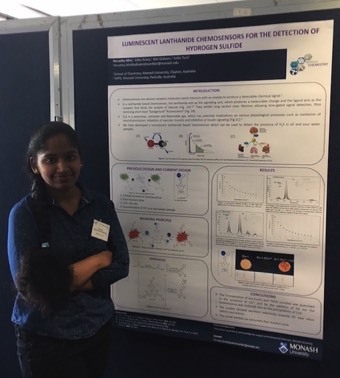 Congratulations to Anjie, Calum, Parvathy and Matt who all presented research posters at RACI Org 18, held in Perth. Congratulations to Debarati who presented her confirmation seminar today! We have been awarded Australia-Germany Joint Research Co-operation Scheme Funding for 2019/2020 for a project entitled “Development of Lanthanide Complexes with Switchable Luminescent Properties as Probes for Hydrosulfide Ions”. Congratulations to Jack Dorrat who finished his Honours degree today. Good luck with your future and hope to see you next year! Very pleased to have been promoted to Associate Professor! Parvathy and I are excited to be spending the next two weeks in the laboratory of Prof. Mike Ward at Warwick University as part of the Monash-Warwick Alliance collaboration. Farewell to Tyson who is leaving the group. Thanks for your hard work! Congratulations to Mayoorini and Parvathy who presented their research posters at ICFE-10 today. Parvathy, Mayoorini and I are excited to be heading off to the 10th International Conference on f-Elements (ICFE-10), which is being held in Lausanne, Switzerland. Farewell to Matt Winnett who is leaving the group to take up a position at Slade Health. Good Luck Matt! I’m excited to be heading off to Québec, Canada to attend ISMSC-2018, where I’ve been selected to present a short talk as well as a poster. All the very best to Sri who is giving an oral presentation on his PhD research at the World Polymer Macro conference in Cairns. Very excited to be awarded the Faculty of Science Award for Excellence in Postgraduate Supervision for 2018. Many thanks to the group for nominating me! 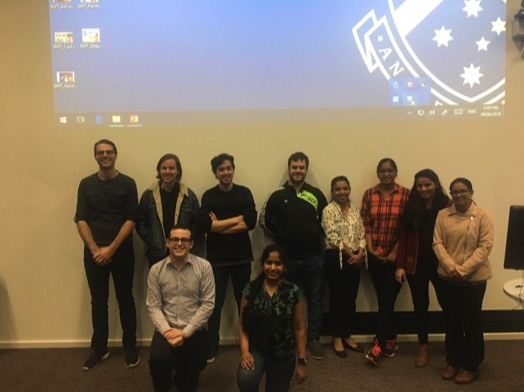 Congratulations to Anjie, Parvathy and Mayoorini who all presented in the School of Chemistry 3 Minute Thesis Competition. Excellent presentations by all! We have received funding from the University Interdisciplinary Research Program to investigate the development of a micro-nano device for the detection of cancer cells. Farewell to Callum Adams who is returning to the UK to complete his studies at Cardiff University. You will be missed Callum! Congratulations to Esma who presented her confirmation seminar today! Congratulations to Anjie on her research presentation at CSIRO today. 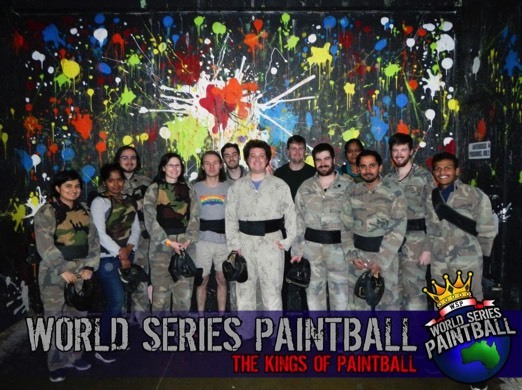 Lots of fun had by all at our mid-year group outing! Congratulations to Genevieve Clarke who presented her final talk as part of her third year project (CHM3990) today. Congratulations to Anjie who presented her confirmation seminar today! Very excited to welcome Prof. Mike Ward and Dr Chris Taylor who are visiting as part of the Monash-Warwick Alliance collaboration. Congratulations to Jack Dorrat who presented his introductory Honours talk today. Welcome back to Sam Waker who will be doing a PhD project with David Turner and myself. Our paper "Synthesis and evaluation of aminobenzothiazoles as blockers of N- and T-type calcium channels” has been accepted for publication in Bioorganic & Medicinal Chemistry. Congratulations to both Anjali and Anjie! Welcome back to Calum Butler who will be doing a PhD project with Rico Tabor and myself. 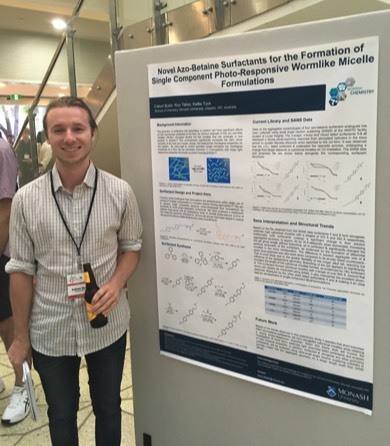 Calum will be researching surfactants for formation of single surfactant light responsive wormlike micelle systems. Welcome to Genevieve Clarke who is doing the third year project unit (CHM3990) with the group. She will be looking at the synthesis of potential analgesics. Congratulations to Esther Miriklis who presented her final poster as part of her second year project (CHM2990) today. Welcome to Matthieu Schmit, a new PhD student who will be joining our medicinal chemistry group. Matt will be investigating the design and synthesis of neuronal ion channel blockers. Welcome to Jack Dorrat who is undertaking Honours in the group this year. Jack will be working on the development of luminescent sensors. Our paper "Modified gold nanoparticles for the temperature-dependent colorimetric detection of mercury and methylmercury” has been accepted for publication in ChemistrySelect. Congratulations to both Maggie and Ethan! Welcome to Tyson Belz, a postdoctoral researcher who will be researching the rational design of thiostepton antibiotics that target the bacterial ribosome. Welcome to Debarati Bhadury, a new PhD student who will be working on the development of on pack visual indicator of eating quality and freshness of beef and lamb products. We are excited to have received Monash-Warwick Alliance funding with Prof. Mike Ward from the University of Warwick. Congratulations to Anjali who passed her PhD defense today. All the very best for the future Anjali! 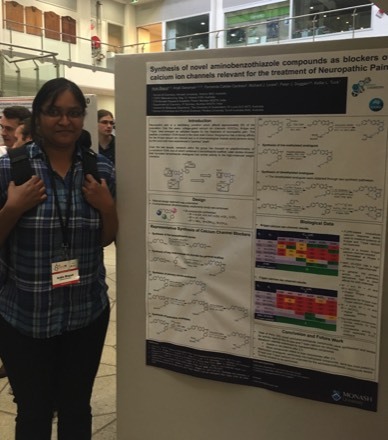 Congratulations to Parvathy and Mayoorini who presented their work as posters at the Annual Inorganic Chemistry Symposium. 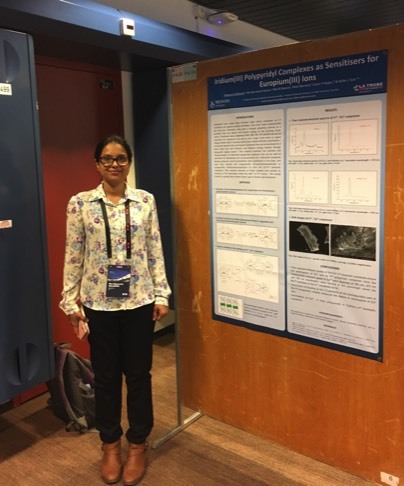 Further congratulations to Parvathy who was awarded a poster prize! All the paperwork for our project funded by Meat and Livestock Australia for the development of on-pack visual indicators has been signed. We look forward to welcoming the PhD student working on this project early next year (co-supervised with Dr Joanne Tanner, Monash Engineering). 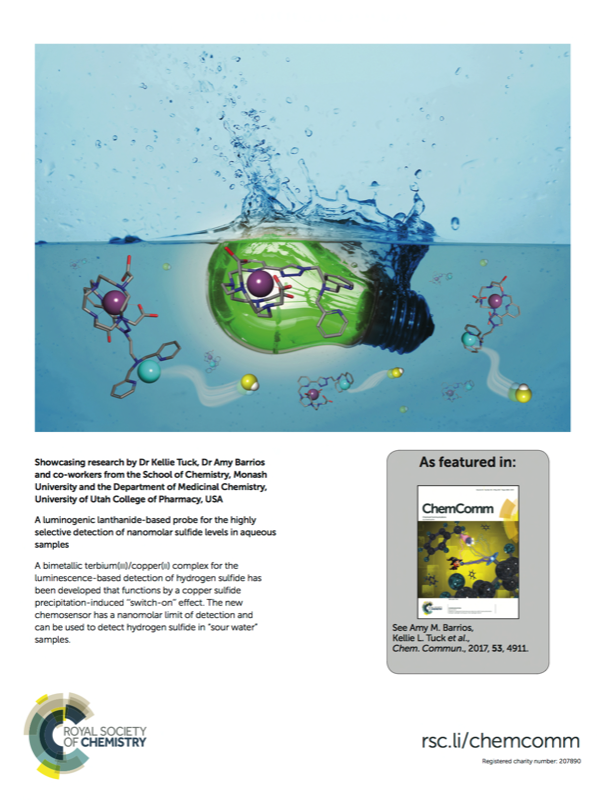 Our invited review article entitled "Lanthanide complexes for luminescence-based sensing of low molecular weight analytes” has been accepted for publication in Coordination Chemistry Reviews. Congratulations Maggie! Welcome to Esther Miriklis who is doing her second year project unit (CHM2990) with the group. 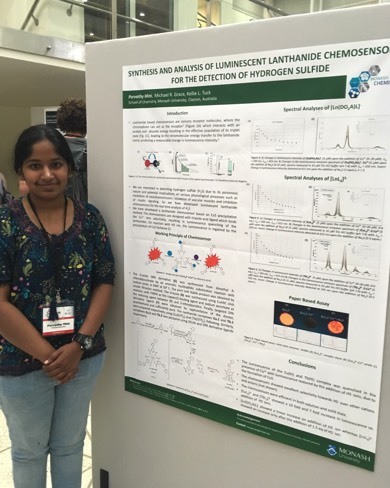 She will be looking at lanthanide-based probes for the detection of zinc ions. We are excited to have received Faculty Seed Funding via the Faculty of Science and Faculty of Medicine, Nursing and Health Sciences (MNHS) Interdisciplinary Research Seed Funding Scheme 2017, to research the rational design of thiostepton antibiotics that target the bacterial ribosome. Our paper entitled "Modulating the activity of membrane-active peptides through Zn(II) complexation" has been accepted for publication in Tetrahedron Letters. Welcome to Callum Adams who is exchange student from the University of Cardiff, UK. He will be working the development of potential analgesics project. Farewell to Sofia who is returning to France to complete her studies at École Nationale Supérieure de Chimie de Montpellier (ENSCM). 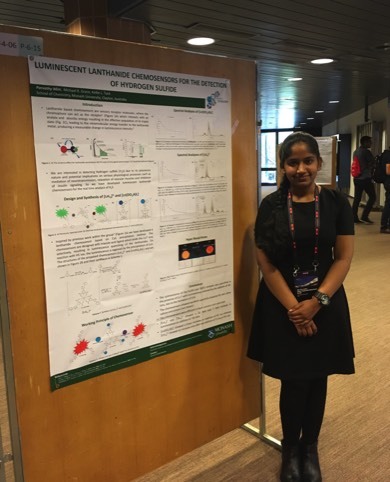 Congratulations to Mayoorini and Parvathy who attended and presented posters at the RACI Centenary Congress. We have received Faculty Seed Funding via the Faculty of Engineering and Faculty of Science Interdisciplinary Research Seed Fund Scheme 2017, to investigate ammonia photonic sensors for water contamination monitoring. Congratulations to Yih Ching on the submission of her PhD thesis titled “Preparation, Characterisation and Development of Novel Bi(V) Complexes as Anti-Leishmanial Drug Candidates”. Farewell to Maggie who is leaving the group this week to take up a postdoc position at Chimie Paris with Prof. Gilles Gasser. Good luck Maggie!!! Congratulations to Anjali on the submission of her PhD thesis titled “Design and Synthesis of Small Organic Molecules as Blockers of Neuronal Calcium Ion Channels Relevant to Neuropathic Pain”. Our paper entitled "Inhibition of human N- and T-type calcium channels by an ortho-phenoxyanilide derivative, MONIRO-1" has been accepted for publication in the British Journal of Pharmacology. Congratulations to Joel Sypher who presented his final talk as part of his third year project (CHM3990) today. Congratulations to Matt Winnett who submitted his honours thesis today. Good luck with your future! Welcome to Anjie Bispat who will be doing a PhD in the group. Anjie’s project is on the development of compounds that have the potential to be used as analgesics. Welcome to Sofia Pudikova who is an exchange student from École Nationale Supérieure de Chimie de Montpellier (ENSCM). She will be working on the development of potential analgesics. Congratulations to Matt Winnett who presented his final Honours talks today. Good luck for the remaining weeks. Congratulations to Maggie on being awarded a University PPA (Postgraduate Publication Award). Congratulations to Maggie on the submission of her PhD thesis titled “Chemosensors for Environmentally and Biologically Relevant Ions”. Our paper entitled "A luminogenic lanthanide-based probe for the highly selective detection of nanomolar sulfide levels in aqueous samples" has been accepted for publication in Chemical Communications. The article is showcased on the back cover of the journal. Well done to Maggie! Welcome to Joel Sypher who is doing the third year project unit (CHM3990) with the group. He will be looking at the synthesis of potential analgesics. Congratulations to Mayoorini who presented her confirmation seminar today! Farewell to Ben. It has been a fun 4 weeks. Good luck with your 2nd year studies this year! Welcome to Parvathy Mini, a new PhD student who will be working on the development of sensors. Welcome to Ben Lowe who is doing an Advanced Chemistry research project with us for the next 4 weeks. Congratulations to Calum Butler and Ricki Wilcox who finished their honours degree today. Good luck with your future! 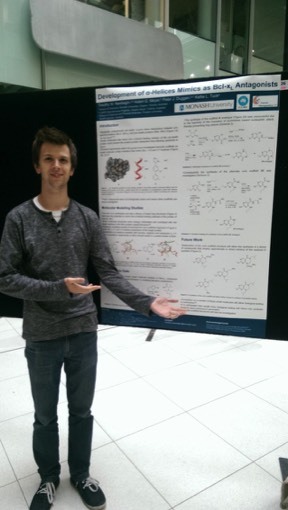 Congratulations to Lachie Richardson who presented his final poster as part of his second year project (CHM2990) today. Congratulations to Sam Walker who presented his final talk as part of his third year project (CHM3990) today. Congratulations to Calum Butler and Ricki Wilcox who presented their final Honours talks today. Good luck to you both for your remaining weeks. Welcome to Nicholas Seah who is doing a student placement in the lab for 12 weeks. Nicholas is studying an undergraduate Chemistry degree at the Nanyang Polytech. Congratulations to Maggie on presenting a poster on her research at EUROBIC in Budapest, Hungary. Congratulations to Maggie on presenting a talk on her research at NZIC16 in Queenstown! Farewell to Max Springer who is returning to Liepzig University to complete his undergraduate studies. Good luck! Welcome to Matt Winnett who is undertaking mid-year Honours in the group this year. Matt will working on the development of luminescent sensors for the detection of zinc ions. Welcome to Sam Walker who is doing the third year project unit (CHM3990) with the group. He will be looking at compounds for the detection of HS-. Welcome to Lachie Richardson who is doing the second year project unit (CHM2990) with the group. He will be synthesizing small molecules that we hope will be calcium blockers. Congratulations to Briony Shipsides who presented her final talk as part of her third year project. Welcome to Max Springer who is an exchange student from Universität Leipzig. Congratulations to Calum Butler and Ricki Wilcox who presented their introductory Honours talks today. Farewell to Anjali Sairaman who is returning to IITB to complete her joint IITB-Monash PhD studies. We are sad to see you go. Good luck with your remaining experiments. Welcome to Briony Shipsides who is doing a third year project (CHM3990) within the group. She will be synthesizing small molecules that we hope will act as calcium blockers. Congratulations to Sri Vanarasi who presented his PhD confirmation talk today. Welcome to Calum Butler and Ricki Wilcox who are undertaking Honours in the group this year. 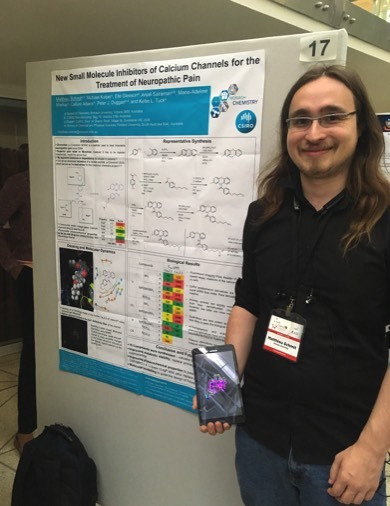 Calum will be working on the development of luminescent sensors for HS- and Ricki will be investigating the development of compounds that have the potential to be used as analgesics. Good luck to you both! Our paper entitled "Cellular uptake and photo-cytotoxicity of a gadolinium(III)-DOTA-naphthalimide complex “clicked” to a lipidated Tat peptide" has been accepted for publication in Molecules. Well done to Maggie for her contribution! Our paper entitled "Luminescent alkyne-bearing terbium(III) complexes and their application to bioorthogonal protein labeling" has been accepted for publication in Inorganic Chemistry. Well done to Maggie for her contribution! 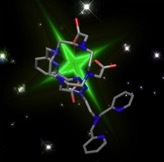 Our paper entitled "Exploiting the Biginelli reaction: nitrogen-rich pyrimidine-based tercyclic α-helix mimetics" has been accepted for publication in Tetrahedron. Well done, Ze! Congratulations to Anjali Sairaman, Tim Newbegin and Maggie Aulsebrook who presented their work as posters at the 40th Annual Synthetic Symposium. Further congratulations to Maggie Aulsebrook who was awarded a poster prize! 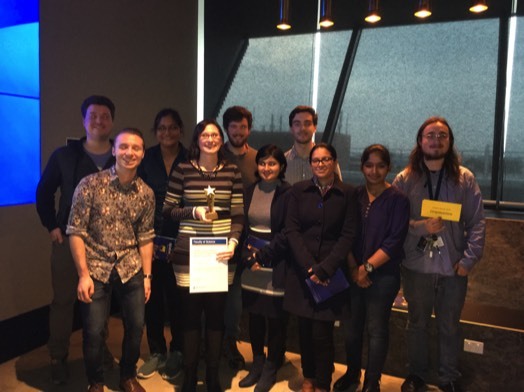 Farewell to Stephanie Ong, who completed a student placement in our lab. All the very best for your future studies! Congratulations to Rahad Rahman and Ethan Watkins who finished their honours degree today. Good luck with your future endeavours! Our paper entitled "Stability and toxicity of tris-tolyl bismuth(V) dicarboxylates and their biological activity towards Leishmania major" is an advance article in Dalton Transactions. Well done, Yih Ching! Congratulations to Ethan Watkins and Rahad Rahman who presented their final Honours talks today. Good luck to you both for your remaining weeks. 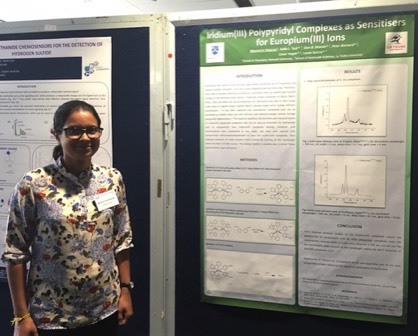 Congratulations to Anjali Sairaman and Yih Ching Ong who presented their work as posters at the Victorian Medicinal Chemistry & Chemical Biology Symposium. Further congratulations to Yih Ching who was awarded a poster prize! A paper entitled "Lanthanide complexes as luminogenic probes for measuring sulfide levels in industrial samples" has been accepted for publication in Analytica Chimica Acta. Welcome to Stephanie Ong who is doing a student placement in the lab for 12 weeks. Stephanie is studying an undergraduate Chemistry degree at the Nanyang Polytech. We hope you enjoy your time here, Stephanie! A paper entitled "Insights on virulence from the complete genome of Staphylococcus capitis" has been accepted for publication in Frontiers in Microbiology. A paper entitled "M2 macrophage accumulation in the aortic wall during angiotensin II infusion in mice is associated with fibrosis, elastin loss, and elevated blood pressure" has been accepted for publication in the American Journal of Physiology - Heart and Circulatory Physiology. Our paper entitled "Coumarin-based fluorescent sensors for zinc(II) and hypochlorite" has been accepted for publication in Supramolecular Chemistry. Well done, Maggie! 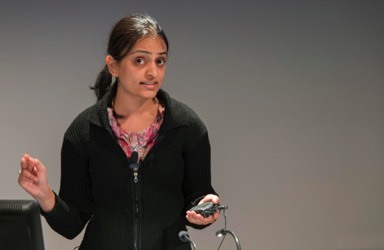 Congratulations to Anjali Sairaman on coming runner-up in the Faculty of Science 3 Minute Thesis competition! A fantastic result! Farewell to Dr Ze Lim who is leaving the group to take up a postdoctoral position at the University of Sydney with Dr Liz New. Good luck, Ze! Our paper entitled "Inhibition of N‐Type Calcium Channels by Fluorophenoxyanilide Derivatives" has been accepted for publication in Marine Drugs. It is the first paper from Elle’s Honours work. Well done to all involved. Welcome to Sri Vanarasi, a joint PhD student supervised by myself and Prof. Neil Cameron (Material Eng). Welcome to Nick Patton. Nick will be undertaking a third year project unit (CHM3990) with us this semester. He will be investigating novel strategies for the luminescent detection of biologically- and environmentally-significant anions. Good luck, Nick! Welcome to Ethan Watkins and Rahad Raman, who are undertaking Honours in the group this year. Ethan and Rahad will work on the development of luminescent sensors for zinc(II), using different approaches. Hope you both have an enjoyable, stimulating and productive time in the lab this year! Welcome to Anjali Sairaman, a joint Monash-IITB student who is in the third year of her PhD. Anjali will be spending a year in the lab, continuing her work on Conotoxin mimetics. Good luck with your research, Anjali, and we hope you enjoy your time here! Our paper entitled "Generation of pseudocontact shifts in proteins with lanthanides using small "clickable" nitrilotriacetic acid and iminodiacetic acid tags" has been accepted for publication in Chemistry - A European Journal. Welcome to Calum Butler. Calum will be undertaking a CHM2990 summer project with us. He will be investigating novel strategies for the luminescent detection of biologically-important anions. Enjoy your time in the lab, Calum! Congratulations to Dr Sunny Kim who graduated today! Sunny, we wish you all the best for your future. 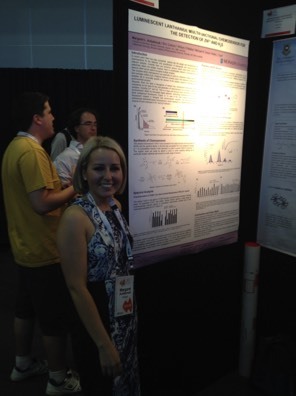 Congratulations to Maggie on presenting her poster at the RACI National congress 2014 in Adelaide! Tim and Maggie presented their work at the 39th Annual Synthesis symposium. Great work! Ethan Watkins gave an excellent third year talk today. Well done! We hope to see you next year! Our paper entitled "Enantioselective Total Syntheses of the Proposed Structures of Prevezol B and Evaluation of Anti-Cancer Activity" has just been accepted for publication in Organic and Biomolecular Chemistry. It is the second paper from Anna’s PhD work. Well done to Anna and everyone else involved! Welcome to Ethan Watkins. Ethan will be undertaking a third year project unit (CHM3990) with us this semester. He will be investigating novel strategies for the detection of Zn(II). Good luck, Ethan! Congratulations to Sunny on the submission of her PhD thesis titled “Absolute Molecular Configuration Strategies Using Preparative Gas Chromatography and Multidimensional Gas Chromatography with Spectroscopy”. Farewell to Matt Probert. Matt has completed his student placement and will be having a well-deserved holiday in Australia before returning to the UK to complete his degree. Good luck, Matt! 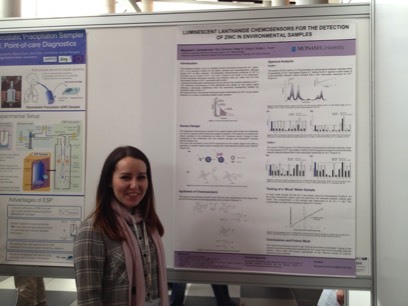 Congratulations to Maggie on presenting her poster at the Biosensor 2014 conference! Dr Zelong Lim and Dr Anna Leung will be attending their doctoral graduation tonight. Congratulations to you both! Also congratulations to Elle Gleeson who will be graduating with first class honours! Our paper entitled "An iterative in silico and modular synthetic approach to aqueous soluble tercyclic α-helix mimetics" has just been accepted for publication in Organic and Biomolecular Chemistry. It is the first paper from Ze’s PhD work. Well done to Ze and everyone else involved! 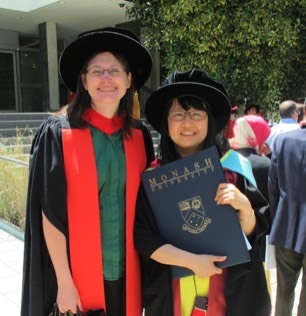 Good luck to Dr Anna Leung who is leaving the group to take up a position at ANSTO. Our paper entitled "The synthesis of luminescent lanthanide-based chemosensors for the detection of zinc ions" has just been published online in Tetrahedron. It reports part of the work conducted by Maggie Aulsebrook during her Honours year. Well done to Maggie and everyone else involved! Welcome to Matt Probert, who is doing a student placement in the lab for 14 weeks. Matt is studying an undergraduate Chemistry degree at the University of Warwick. We hope you enjoy your time here, Matt! This website is the sole responsibility of Dr Kellie Tuck. Monash University is not responsible for its content. Reproduction in whole or part of this website in any form or medium is prohibited without the express written permission of Dr Kellie Tuck. © 2013 K. Tuck. All rights reserved.